Doug and Danielle in episode two. Danielle Lapointe and Stephanie Janusauskas. A good web series can go along way, as anyone who has watched High Maintenance —which was recently picked up by HBO—would know. Alas, this time around, the reach isn’t as far as New York City, as this brilliant little web series takes place right in our fine city of Montreal. Shooting the Moon is the glorious brainchild of Danielle Lapoint and Jeremy Sandor, who are recent Concordia Film Production graduates. The web series presents a refreshingly quirky and perfectly awkward take on the post-grad life, as Lapoint—playing herself—attempts to navigate life as a post-grad and make a name for herself in the Montreal film industry. The cringingly funny humour of Shooting the Moon is not to be missed. Premiering on Saturday via the show’s website, Shooting the Moon will feature seven mini-sodes that collectively make up an hour of watch-time. The comedic web series—which has been in the making over the last two years—pokes fun at all types of people, but most of all makes fun of art students “lovingly,” joked Lapoint. 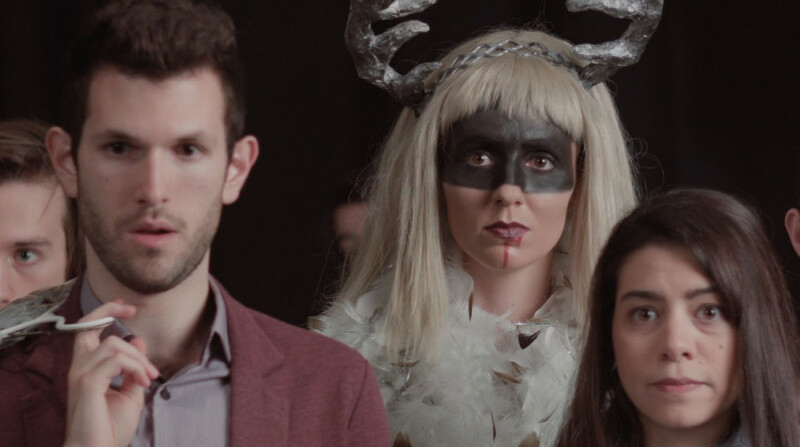 The show starts when Danielle, a witty postgrad from small town Ontario, finds herself stranded in Montreal working at a movie theatre—far from the dreams of a film student. Struggling to accept that her career in filmmaking is currently nul, Danielle tries to get her foot in the door by answering strange ads on Craigslist, only to discover that the gig wasn’t quite what she had in mind. Like many of us, Danielle’s character finds herself trying to navigate a world where everyone is pretending that they are more successful than they actually are. Coincidentally, Sandor’s transition from Danielle’s reality to regular life enables us to see these imagined perceptions of the world through a character that most of us can relate to. For Sandor, who admits that his directing style usually steers away from comedy, it was special to be a part of this project. “It’s really rare for someone to come to you and ask you to direct something,” he explained, adding that in indie film, one usually writes and directs their own content. “It was definitely flattering,” he said sweetly. Eventually, “it pretty much just came together,” he said. With so many people being brought on to the project, the end result was visually stunning. The film quality goes beyond what most would imagine for a blossoming web-series, and with a next-to-nothing budget, to boot. “We’re really new to the game—and you have to prove yourself on the web,” said Lapoint, but both show heads are looking forward to the community’s response to the show.